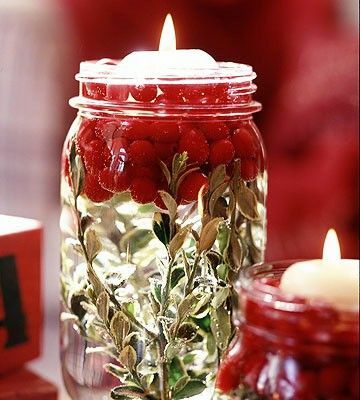 Categories: brilliant ideas Comments Off on Cranberry Sauce – Easy as 1, 2, 3! 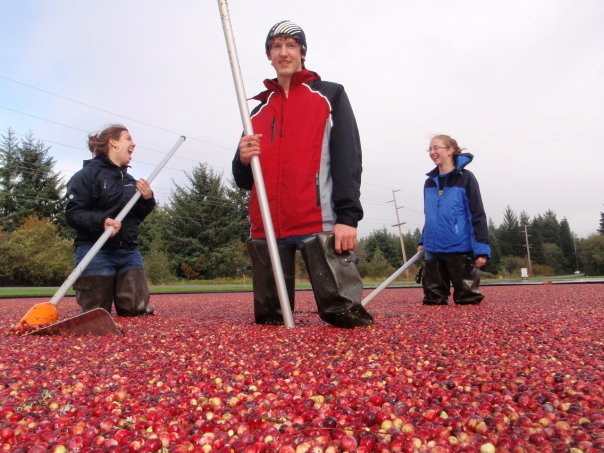 It’s that time of year again–cranberry harvest! 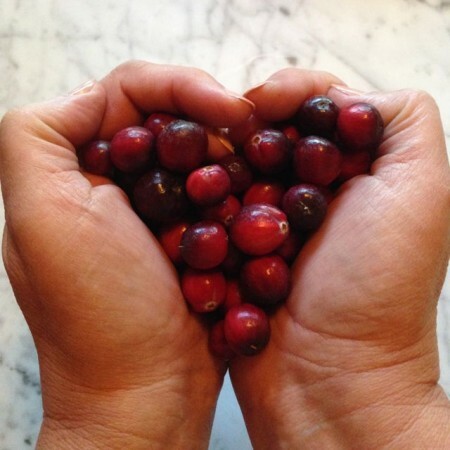 And there’s nothing easier than making your own cranberry sauce. It only takes three ingredients and the taste is a hundred times better than what comes out of a can. 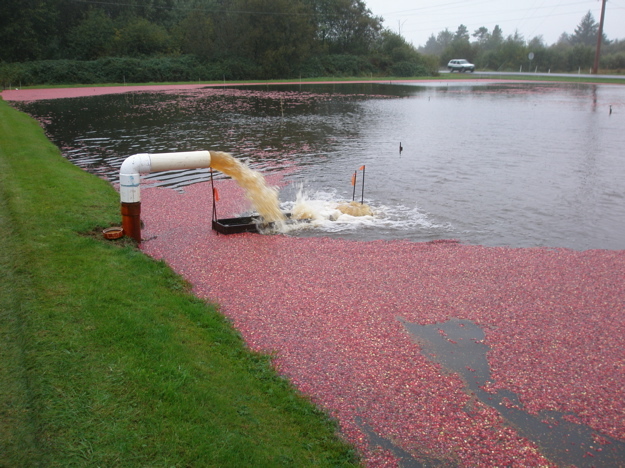 All you do is boil cranberries, sugar and water. I told you it was easy! Once it’s done, you can put it in a covered container and put it in your fridge for up to two weeks, or you can can it to keep it longer or give as gifts. Pour into a dish, cover and chill—or pour into sterilized jars and seal. See, it really was as easy as 1, 2, 3! 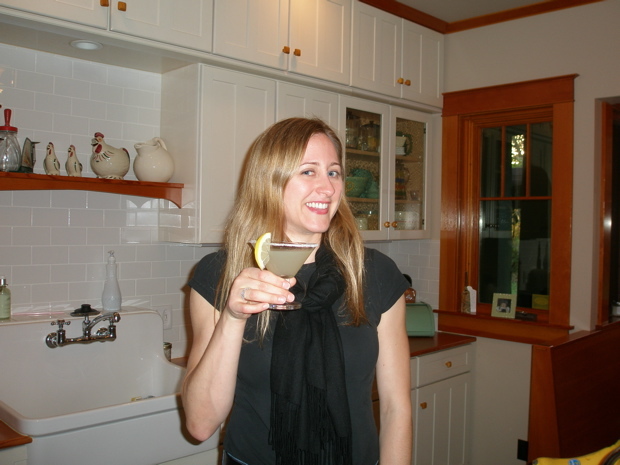 In Sweden last summer I learned to make “saft,” a fruit concentrate that you add to water to make a yummy drink. 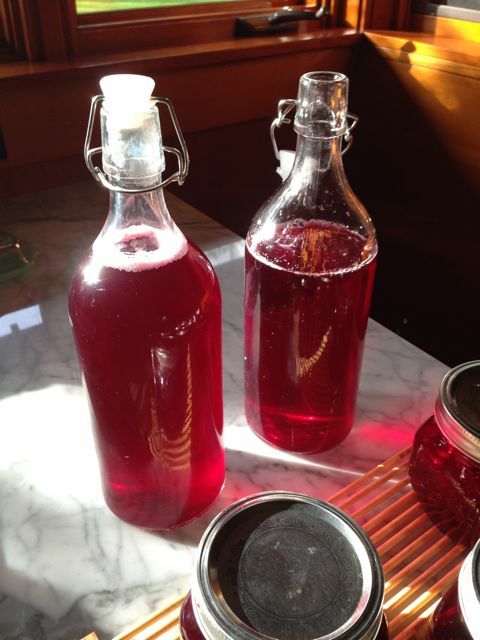 I made rhubarb saft and currant saft. Both were delicious. 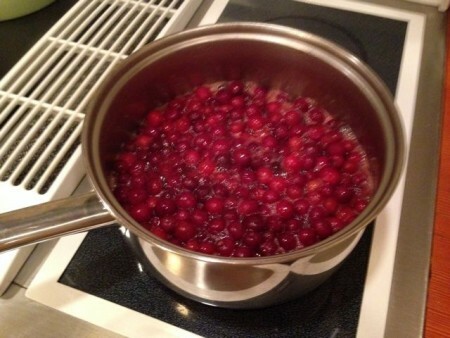 But now that it’s cranberry season here at home, I decided I should try my hand at making some cranberry saft! A few people have asked for the recipe, so here it is. Combine sugar and water in a saucepan and heat until sugar dissolves. 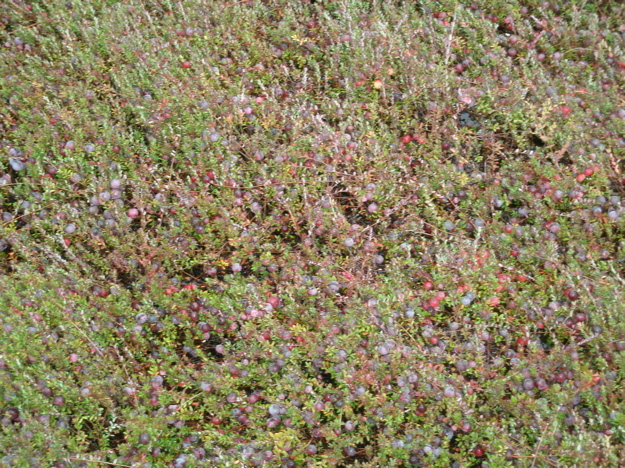 Add berries and bring to a boil. Boil 15 minutes. 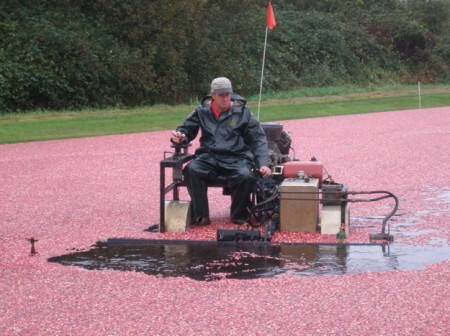 Pour into a jelly bag and let drain several hours. Voila! Saft! Add your syrup to still or sparkling water for a refreshing drink. I find a 1 to 4 ratio of syrup and water suits my taste, but experiment and see what you like. This will keep several weeks in your refrigerator. While Bob and I no longer own a cranberry farm, he does work each harvest season for another grower. I, however, just show up on a sunny day with my camera! I know Kathleen and Kasi through my sister, Sally. 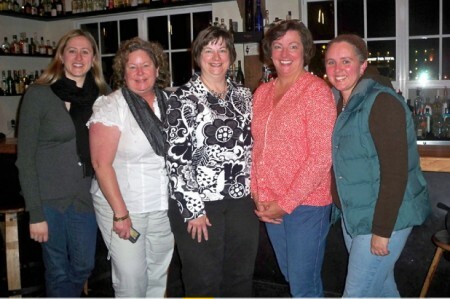 They are both full of fun and crafty gals–and neither had ever been to Long Beach! So, we’d been planning a weekend to get them here. I tried to accommodate them. 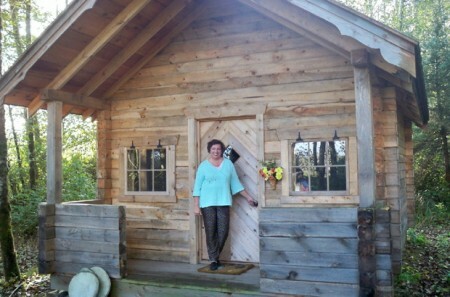 They arrived late Friday afternoon, and we started with a tour of the Swedish Log Cabin. 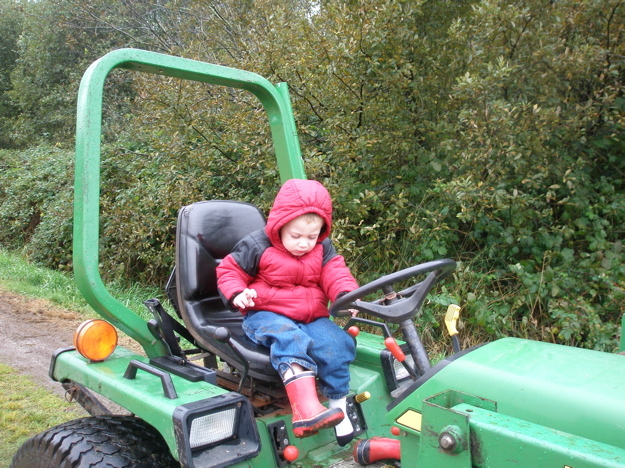 It’s mostly been winterized for the season, but they still had fun looking around. 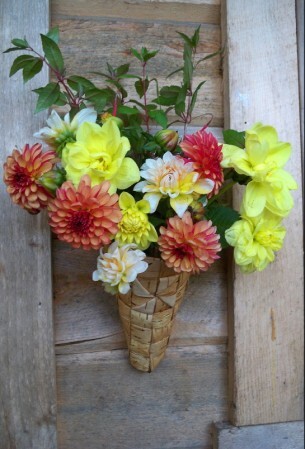 I hope they appreciated that I was out in the pouring rain picking the last of my flowers for them! 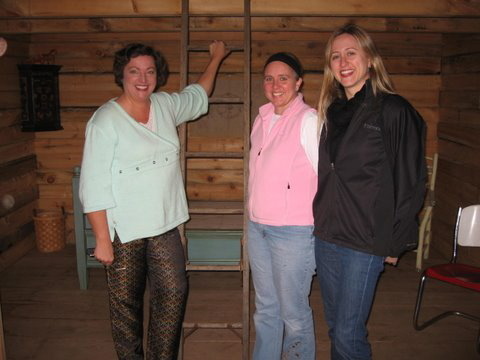 Sally is more handy to have around than a Girl Scout (well, in our case, a Campfire Girl). She brought her professional martini shaker. 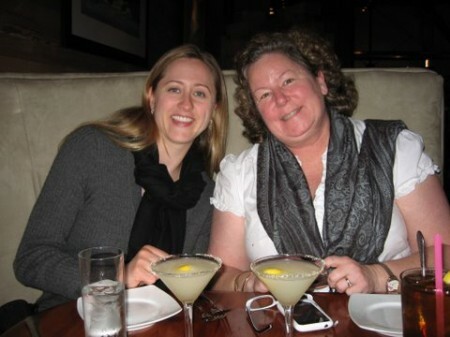 So before we went out for dinner, we enjoyed lemon drops! Then we were off to Jimella’s for a fine dinner! We stayed up late, as promised, and looked at Sally’s photo albums and Kasi’s latest quilt–a work in progress for a friend’s new baby. Saturday morning we slept in a little bit, but not so late we didn’t have time to eat. Then it was off to see cranberry harvest! Kasi and Kathleen went to walk on the beach while Sally and I came back here to get ready for high tea. 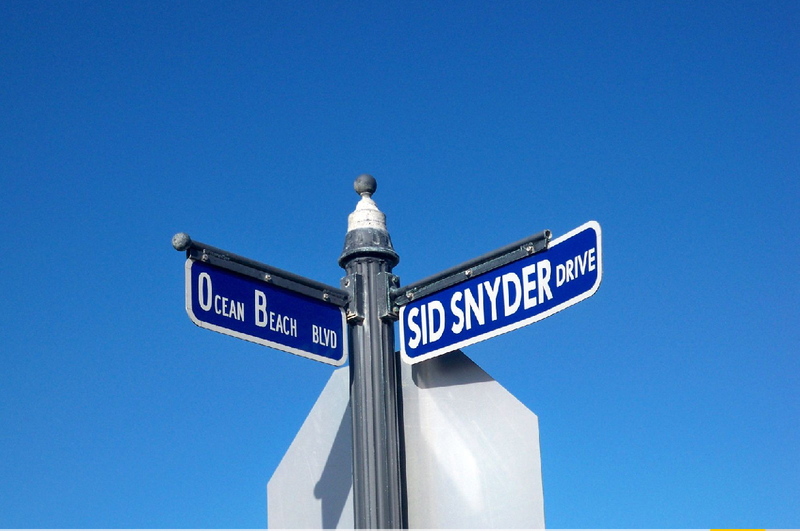 They loved seeing Sid Snyder Drive, the street named for my dad. My mom joined us. 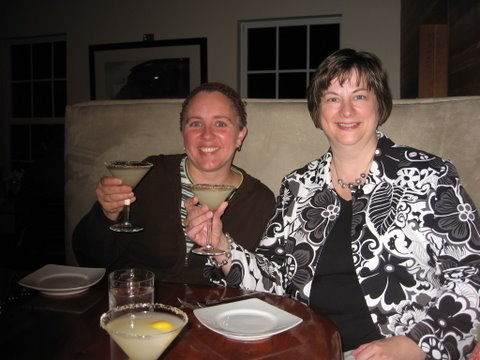 Our first course was Tomato Blue Cheese Soup for sipping. That was followed by our sandwich plate–egg salad, tuna and cucumber/cream cheese sandwiches; carrot crudite and a currant scone. And for dessert, a buche de noel. 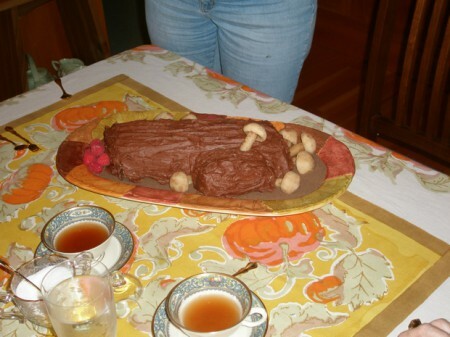 I know, it’s not Christmas–so we decided it was a buche de autumn. I made the mushrooms from almond paste. 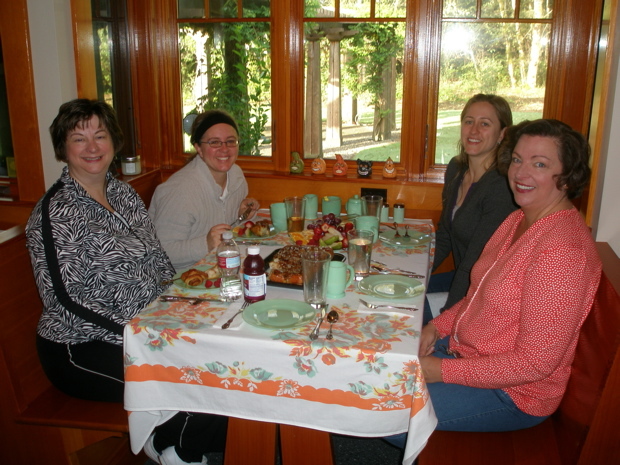 While I did dishes, the others went to see my parents’ house…. 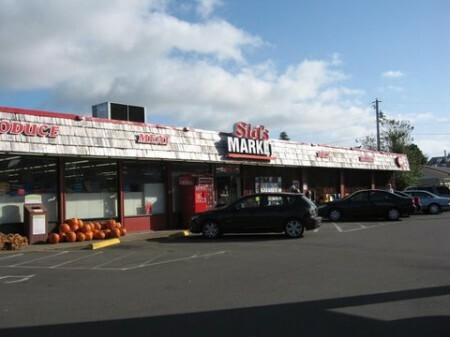 … and the family grocery store, Sid’s Market (a highlight on any tour of the area!). From there is was downtown Long Beach for some shopping. 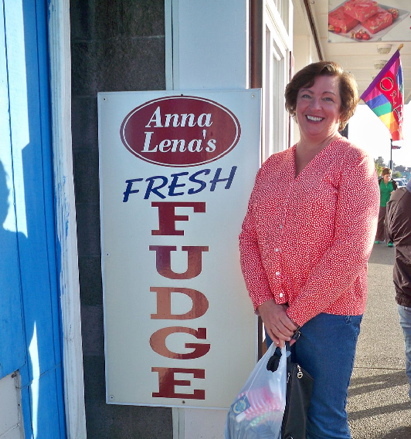 Anna Lena’s Quilt Shop may be gone, but the fudge lives on–at Scrapuccino. 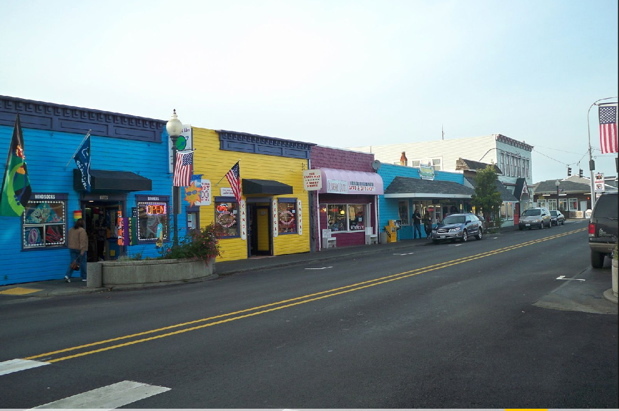 Then it was a trip to Astoria (and a lesson in Lewis and Clark). But, the real reason for our trip was a visit to Monica and a chance to see her studio. Ever the generous hostess, she had made Itty Bitty Poochie Bags for us–and filled them with m&m’s! After filling our senses with all things good and wonderful, we were off to dinner at the Bridgewater Bistro. Why, are those more lemon drops? 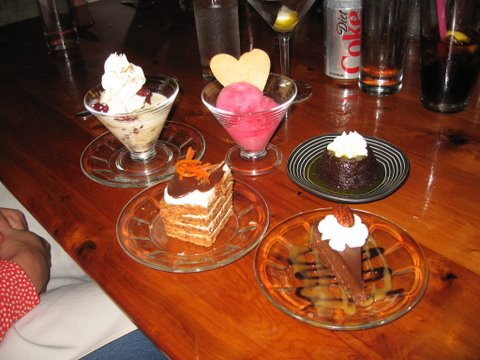 Our food was delicious–and we topped it off with tiny desserts. 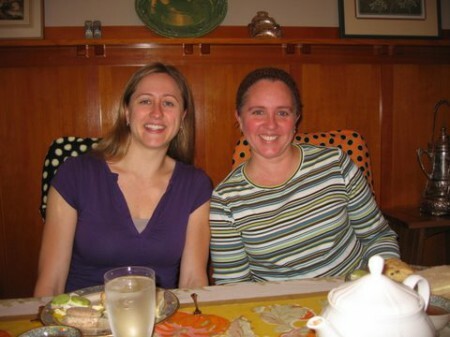 Good food, good friends. Does it get any better than that? 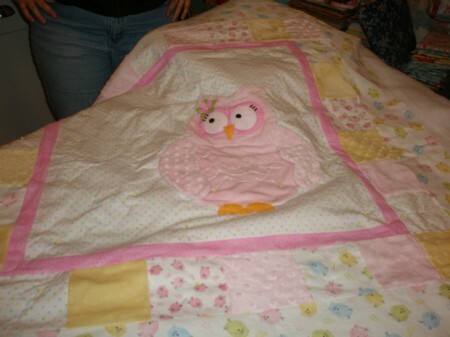 Then it was back here for a late night of show-and-tell from my vintage linen stash and some 1930′s quilts. 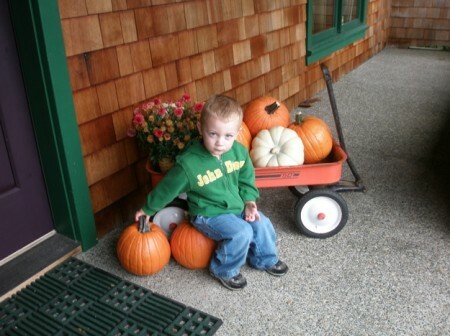 I just has to post a few more photos from harvest–and some of our grandkids who were here to help! Justin got hip boots for Christmas last year. He’s right at home in the bog. That paddle is really heavy, but at six, he’s ready for the task. 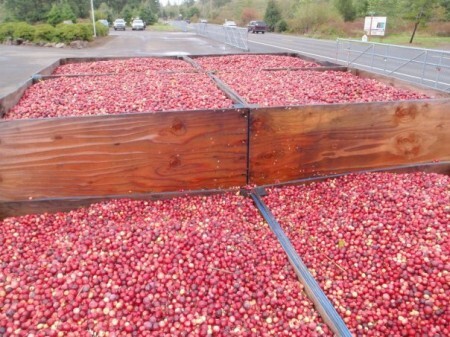 I never get tired of watching the totes fill up. I gave up my hip boots years ago. I’ll cook and drive truck, but I stay out of the bog. Oh, there’s a “bogged down” joke here somewhere! 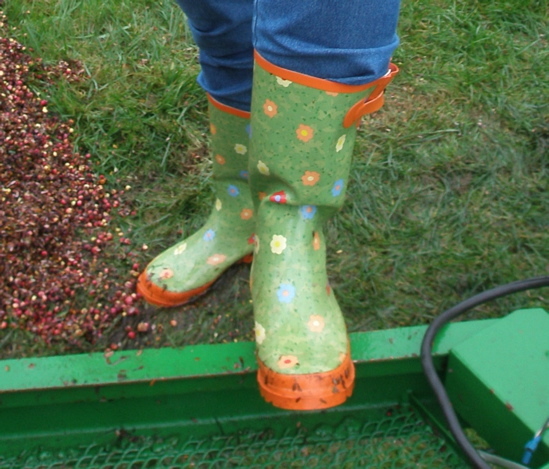 But, I do have the most stylish boots of all! 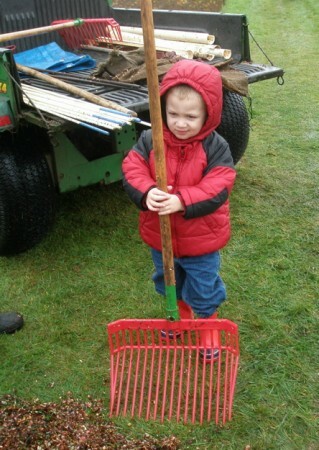 This is 2-1/2 year old Carson, getting the feel of the leaf rake. We’ll have him shoveling before long. 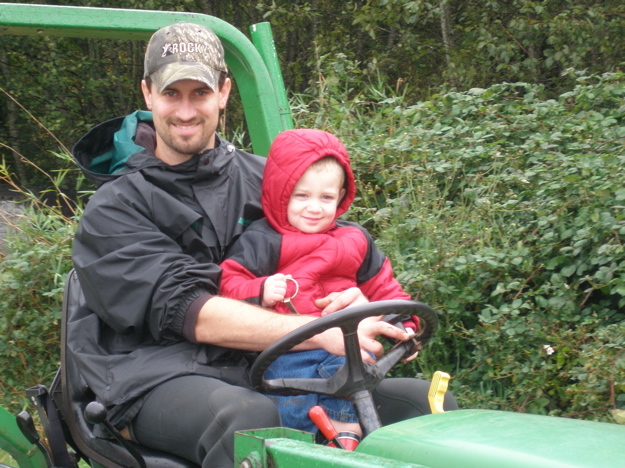 He likes to ride on the tractor with his daddy, Doug. I made the mistake of saying his boots were muddy, at which point he shook them off his feet and wouldn’t put them on again! Megan, Kyle and Marie. Who says harvest isn’t fun? Another trailer loaded and ready to deliver to the receiving station. Here’s Marie with her paddle. 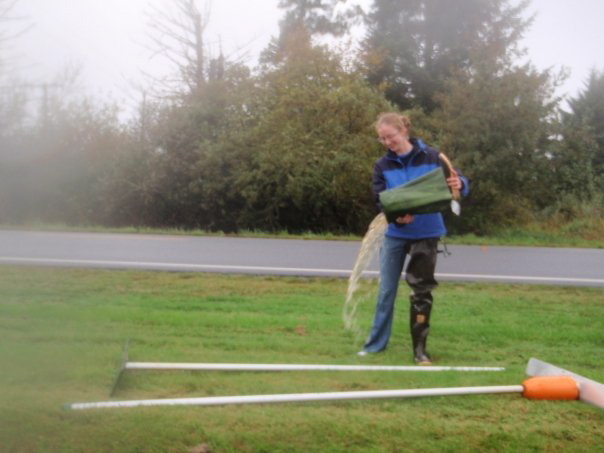 Here’s Marie after she stepped in the ditch! Back home. We didn’t make Peyton work in the bogs–not this year. And isn’t this cute of Carson on our front porch? 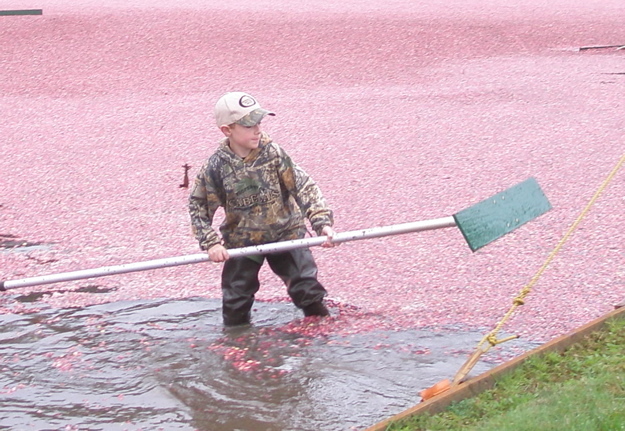 Another cranberry harvest is behind us. Bob can take a big breath and relax! He always stresses so during harvest. 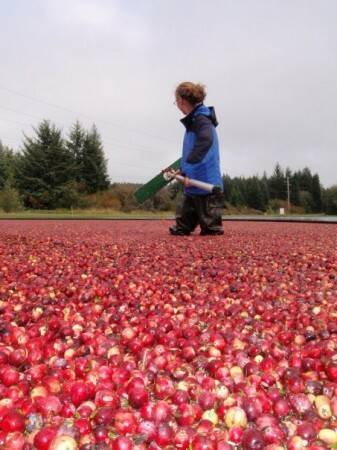 One of our favorite things during harvest is having strangers stop by the bog to see what we’re doing. We love to share the process with them. Cranberry farming is so unique. 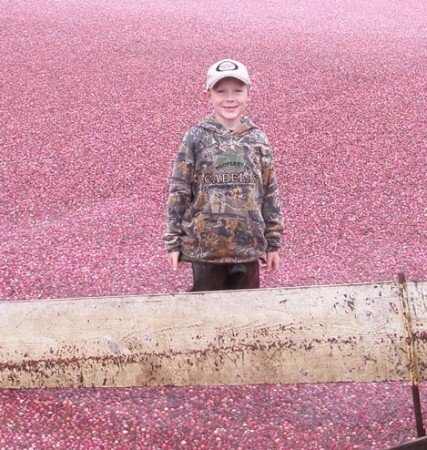 We call our little talks Cranberry 101. I thought it would be fun to share it here, too. 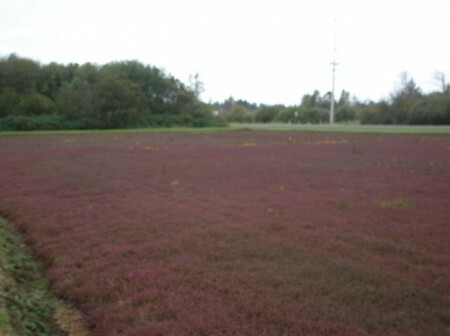 Cranberries grow on vines in naturally occurring peat bogs. 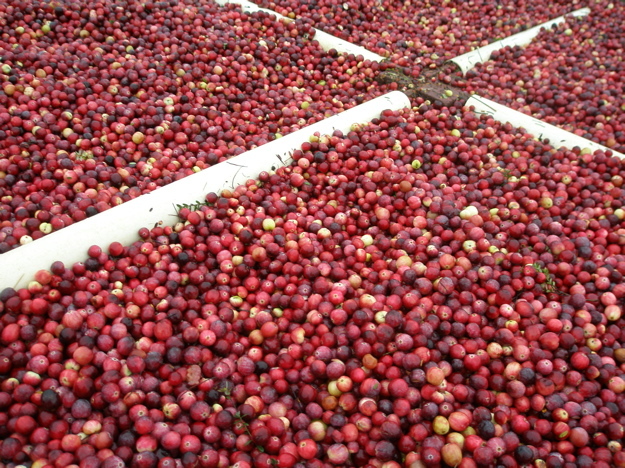 They are not under water except during harvest. If you look carefully, you can see the berries growing in amongst the vines. 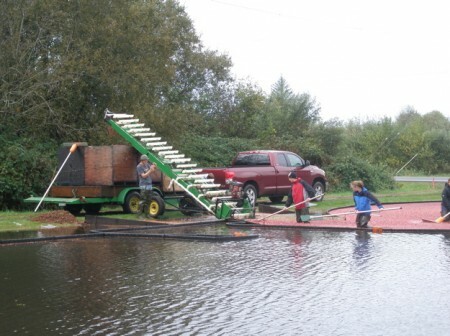 When its time for harvest, we flood the bogs with water from our irrigation ponds. Once the water covers the vines, a machine called a beater is driven over the vines. It has a reel on the front with small steel bars. The reel rotates and knocks the berries off the vines. Cranberries are hollow in the middle, and they float to the surface of the water. Once they’re floating, we use booms and paddles to bring them to one end of the field. An elevator conveys the berries into totes on the trailers. 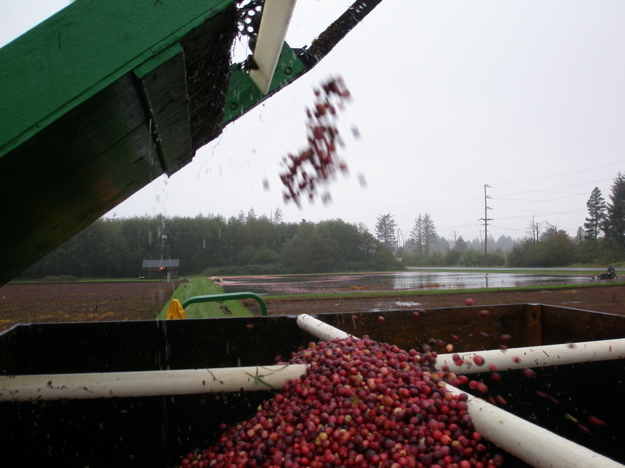 There is also a stream of water washing away leaves and debris as the berries ride up the elevator. There’s between 1000 and 1100 pounds of cranberries in each tote. 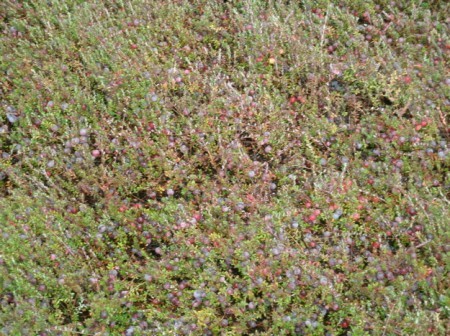 That’s a lot of little red berries! 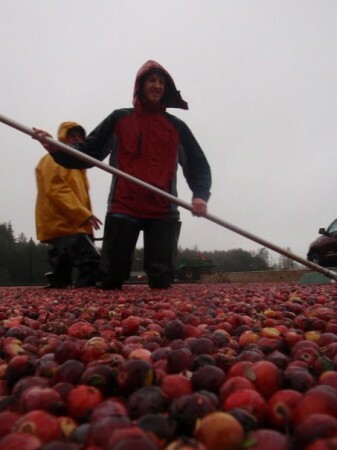 As members of the Ocean Spray Co-op, all we have to do is deliver our crop to the local receiving station, where they are cleaned and hauled off to freezer to await further processing. 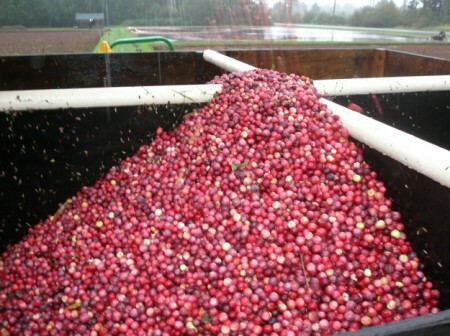 All of our fruit is used for processing (not sold fresh in little bags). Because we have good color, most of it will probably go for juice. So, think of us next time you have a glass! 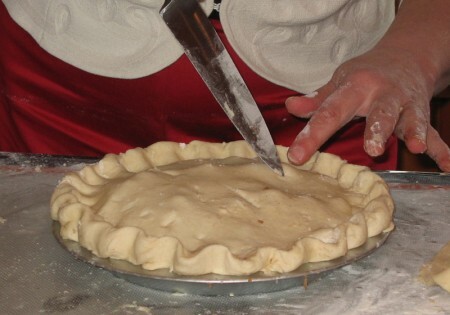 Making pie crust is as easy as, well, pie! Now I know not everyone agrees with that, but it REALLY can be. 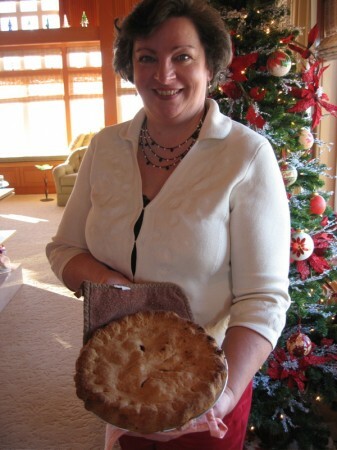 When I mentioned to my friend Carolyn recently that another friend, Monica, wanted me to show her how to make pie crust, Carolyn said she could use a lesson in pie crust making, too. Well, the three of us, along with several others, were going to be at a luncheon at my mom’s house, so I suggested we have a little pie making lesson before lunch. 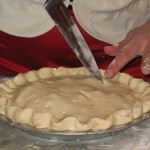 I recently posted about my grandmother’s pie curst recipe, but her recipe makes enough curst for nine two-crust pies! This easy recipe makes enough for one two-crust pie. 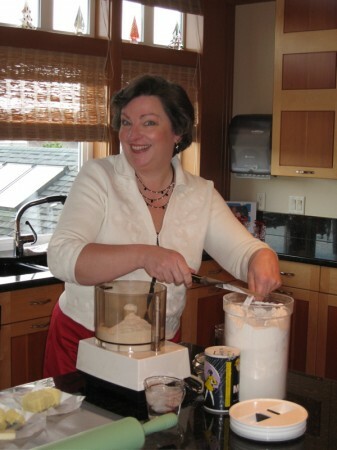 So, if you’re up to a lesson in pie crust, follow along! Rule #1 – Wait–there are no rules. Tip #1 – Make it cold, bake it hot. Be sure your ingredients (all four of them) are cold. Step 1. Put the flour and salt into the bowl of a food processor with the steel blade inside. The big, cheesy grin is not required! Step 2. 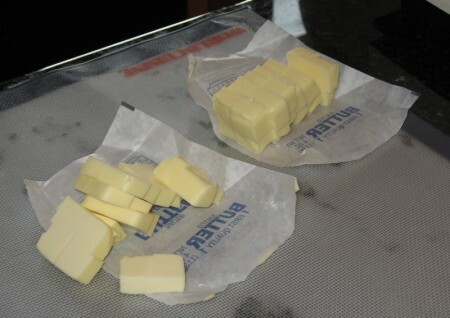 Cut the very cold butter into little cubes. Nothing fancy. Step 3. Before you add the water, put the butter into the bowl. Pulse several times until the butter is cut up into small pieces, about the size of a pea–no smaller. Step 4. This is the only tricky part. Because the moisture content of flour varies, you can never know just how much water you’re going to need to add. 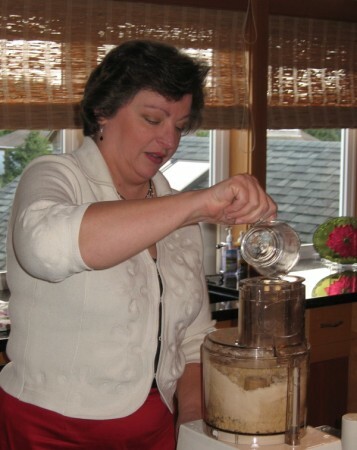 Turn the food processor on and start dribbling a little stream of water through the tube on the top. 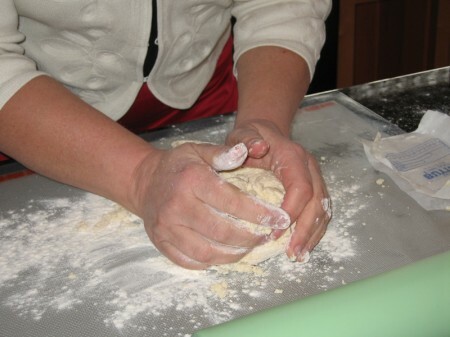 Keep dribbling until the flour in the bowl becomes a dough and starts to pull away from the sides. You can stop and check your progress. You don’t want it to get too wet. Step 5. 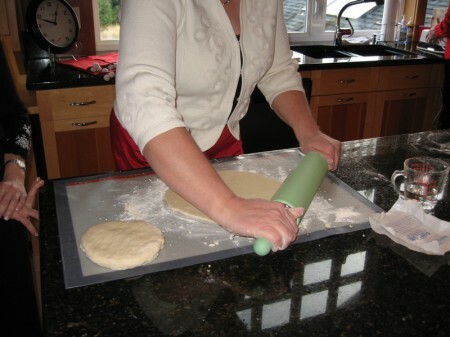 Dump the dough out onto a lightly floured board or Silpat. Knead a couple of times–just a couple of times. All you are doing here is making a nice ball. You don’t want to overwork the dough or it will become tough. Step 6. 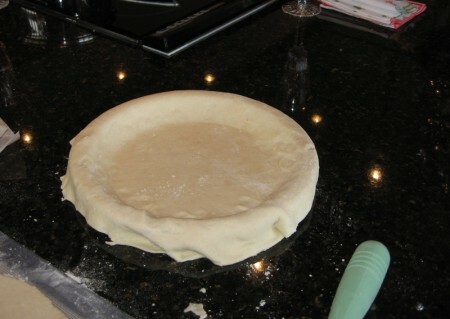 Divide the dough in half and pat each half into a little disk. Wrap each disk in plastic wrap and refrigerate for at least 30 minutes. Overnight is okay! 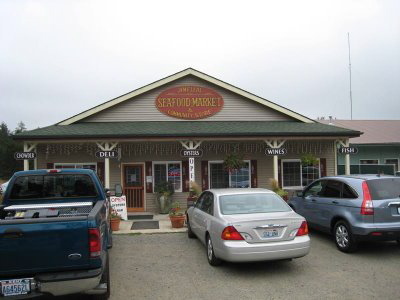 (During this demo, I didn’t have 30 minutes to wait, and my kitchen staff hadn’t made me any swap outs, like the kitchen staff at Martha Stewart does. I must have words with them about this. 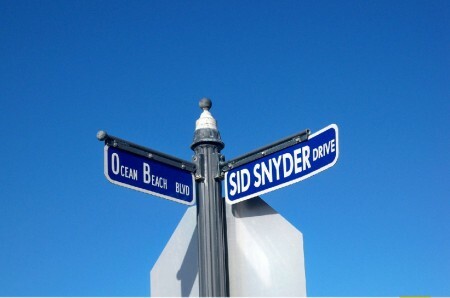 Of course, first I’ll have to find them.) photo here Step 7. Roll one disk out for the bottom of your pie. Just take it easy and roll a little bit in each direction until you have a fairly round piece. Step 8. My sister, who was pressed into doing the photography on the spur of the moment, didn’t get a photo of me wrapping the dough over the rolling pin, but that’s what I do to lift it into the pan. Just drape it over the pin, then lay it into the pan. 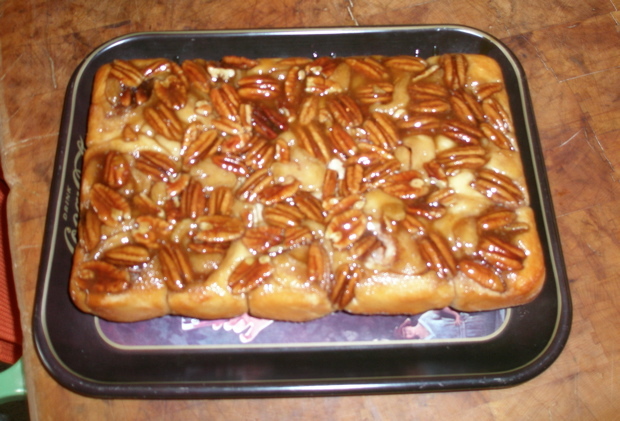 Lightly press it into the bottom of the pan and trim the edges if necessary, leaving some crust hanging over. Note: This recipe makes enough pie crust for a deep dish pie, but this was the pan my mom grabbed. 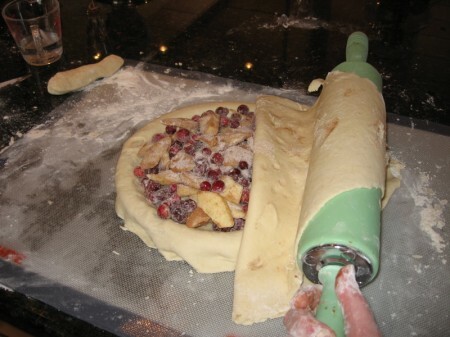 I thought the demo was going to end here, but no one wanted to see good pie crust go to waste, so we raided my mom’s refrigerator and came up with two apples and plenty of cranberries (thanks to her son-in-law, the Cranman). We added some sugar, cinnamon and a little flour and had a filling for our pie. I rolled out the other disk and put it over the top. I crimped the edges, made a couple of slits in the top, and we put it in the oven. 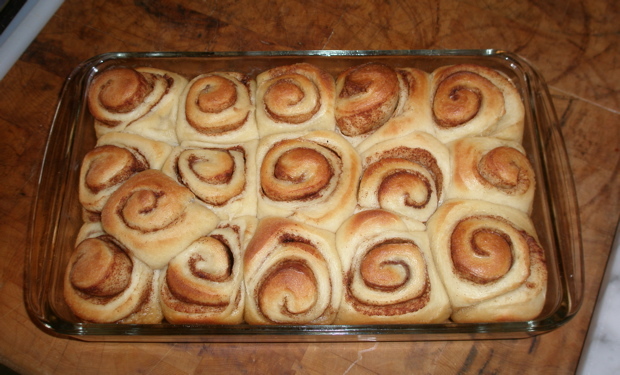 Remember the Tip from the beginning of this post–Make it cold, Bake it hot. That’s the trick. Everything we used to make the pie crust was cold. Now, it needs to go into a hot over. 425 degrees hot. Bake it at this temperature for 15 minutes, then lower the oven to 350 degrees and finish baking. We were having such a great luncheon, I almost forgot to take it out! But, I think it turned out great. And I hope you’re ready to try making pie crust! Let me know how it turns out, and tell all your friends how easy it is–or not. You could let them think that you know magical things that they don’t! 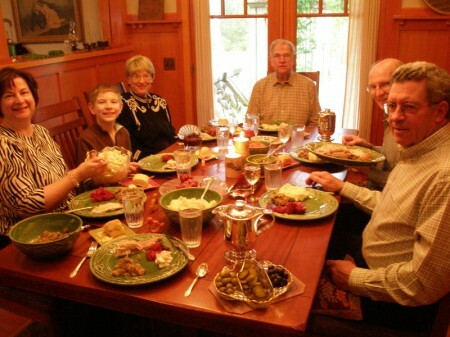 As holidays go, Thanksgiving is a favorite in Anna Lena Land. My parents and my sister’s family all come to celebrate with Bob and me. We have a routine, or is that called a tradition, after doing it this way for several years–and I like that! 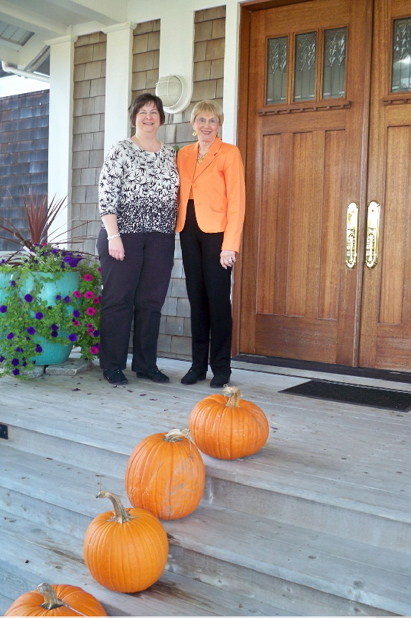 I don’t do a lot of decorating for this holiday, although I should, since I have lots of nice fall decorations. But I do always manage to get out Rebekah and Eli, my grim faced and stoic Pilgrims. They probably look like that because they never get anything to eat. 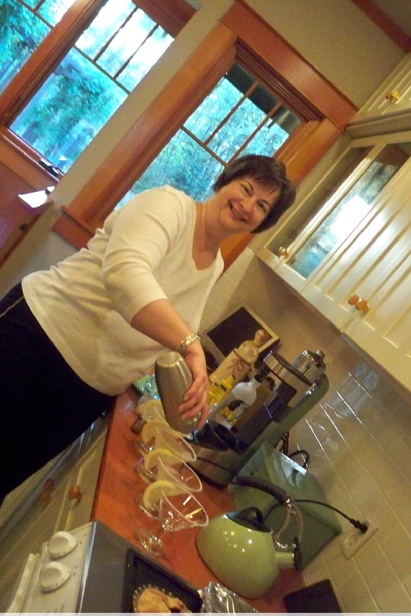 I love to use special dishes–and I do have a lot of them. 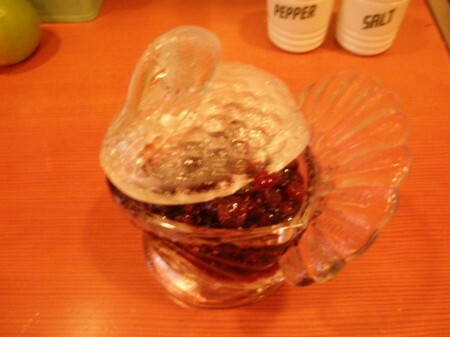 One of my favorites is the special server made for jellied cranberry sauce. 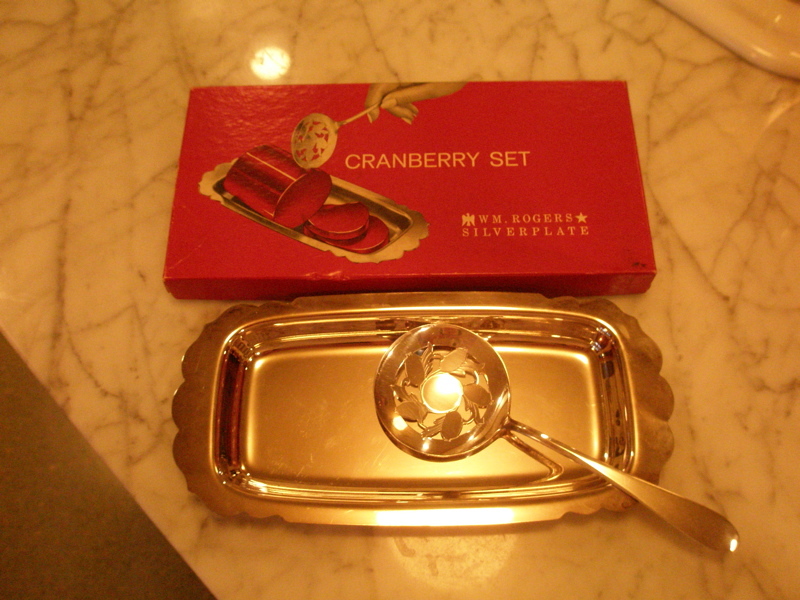 Now, mind you, I don’t really care if I eat jellied cranberry sauce, but I have this cool server, and I like to use it, so we have jellied cranberry sauce! These servers were made in the Fifties or Sixties by Rogers Silver and they were premium offered by Ocean Spray. I’m not sure how it worked, but I think you sent in a couple of labels from Ocean Spray cranberry sauce, and probably a buck or two, and you got this pretty server. 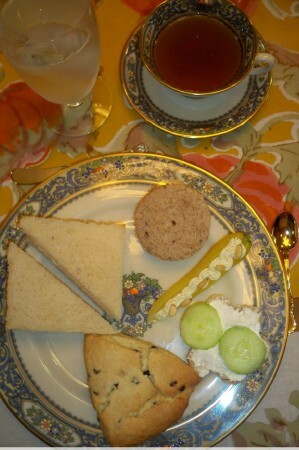 There’s a little tray and the prettiest slicer/server with cutouts forming a cranberry and leaf design. 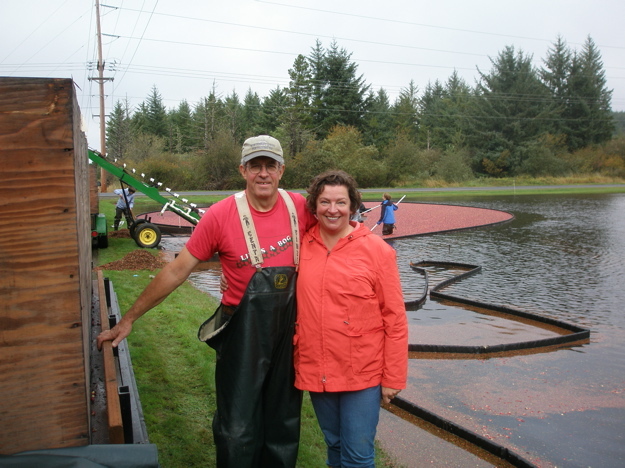 My hubby, also known as the Cranman, and I have a small cranberry farm. 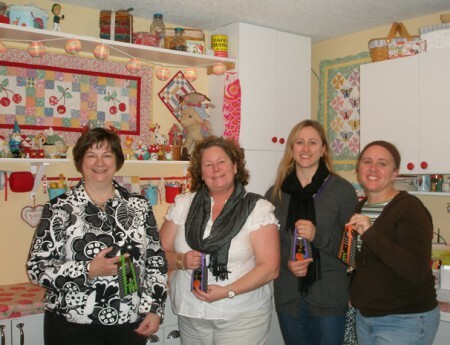 I was away at Quilt Market this year during harvest, but my dear sister-friend Monica came over and took wonderful photos. 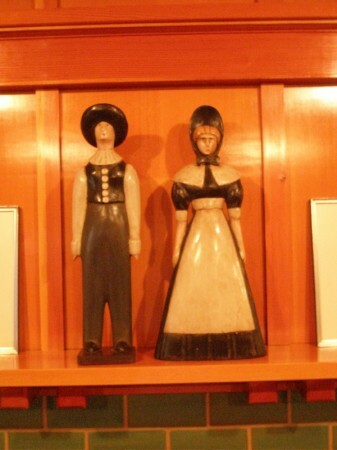 Her husband Tom even got bogged down with Bob. 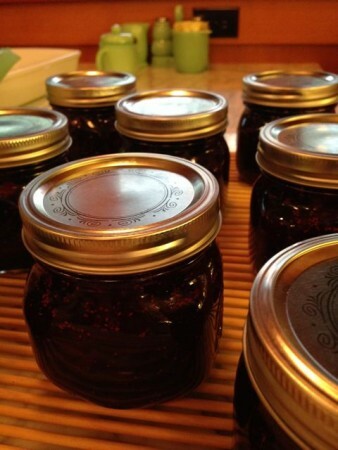 Monica did a great Cranberry 101 on her blog. That girl was really paying attention! 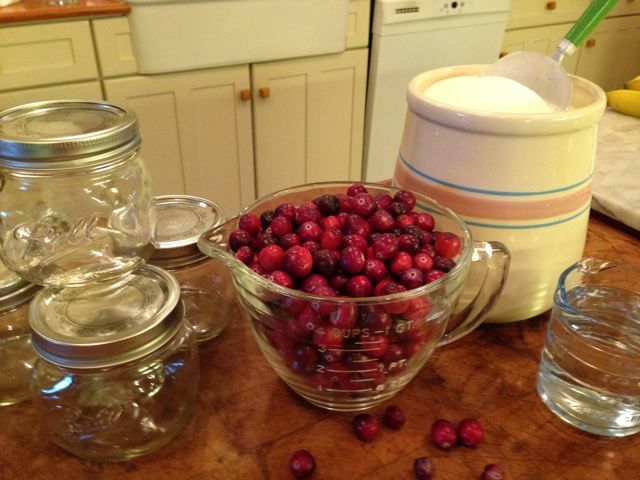 If you don’t know how easy it is to make your own cranberry sauce, let me tell you. 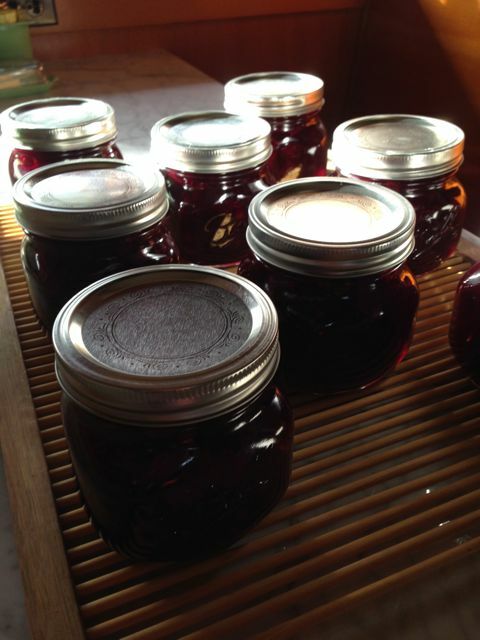 If you can boil water, you can make your own cranberry sauce–and you’ll never eat store bought again (sorry Big Brother Ocean Spray, but I’m still drinking your juice!). Here’s the recipe. 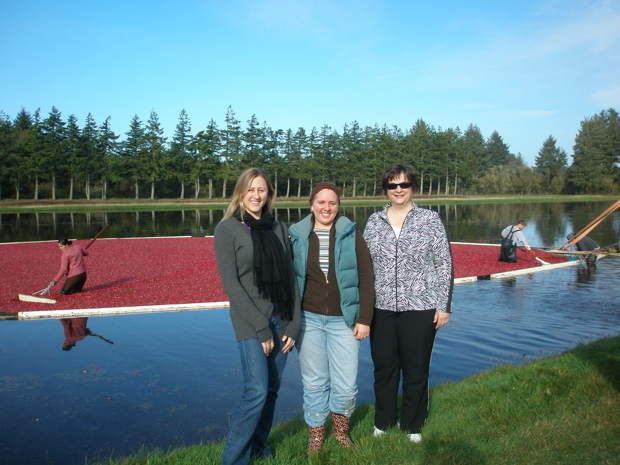 Put these three ingredients in a sauce pan–4 cups cranberries, 2 cups sugar, 1 cup water. Boil for 15 minutes. You’re done. Finished. Over. See, I told you you could do it. 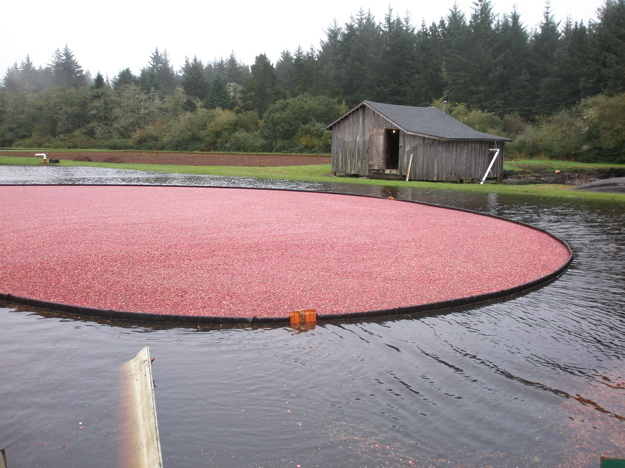 While those cranberries are boiling, you’ll hear little pops as the skins burst. That lets all the natural pectin out, and allows your sauce to set up. Just refrigerate for a couple of hours and serve. Oh, soooooo good! Try it. Please. Then start looking for a cool glass turkey dish to serve your cranberry sauce in. I love mine. It’s pressed glass and oh-so-pretty. My sister Sally is queen of the shoppers. She loves to shop, and just give her a theme and she’s off. 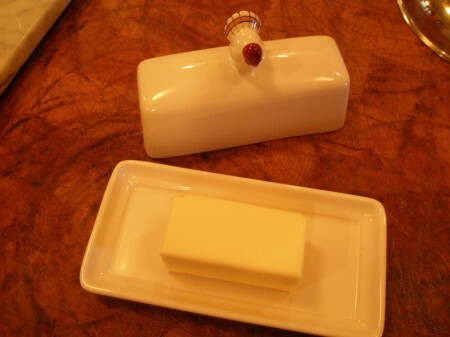 One year, as a hostess gift, she brought me a perfect butter dish for the Thanksgiving table. I love to set a pretty table. 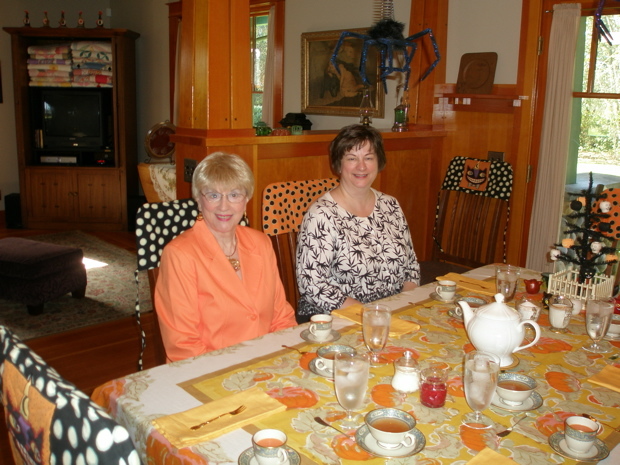 I must admit I have a few sets of dishes to choose from (but not anywhere close to as many as sister Sally). 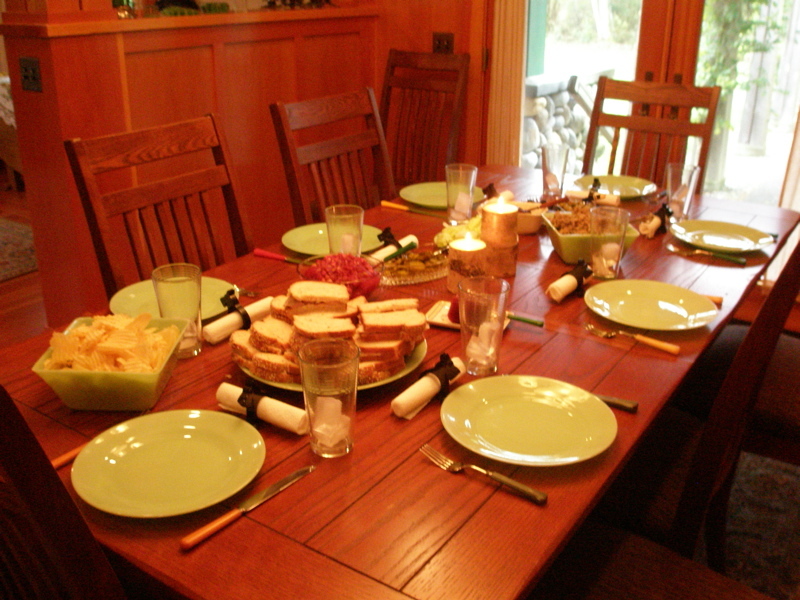 This year I used my pretty pine cone plates. They’re a good choice for Thanksgiving-the color’s great and they have the biggest plates! 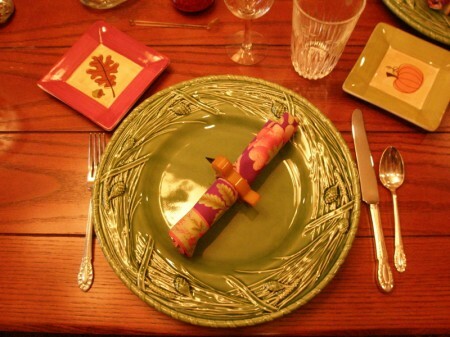 I used my late mother-in-laws flatware and the vintage Bakelite napkin rings. But even more fun than setting the table is the cooking. Through the years we’ve tried adding a few new things to Thanksgiving dinner, but in the end, we all want the same traditional dishes that we’ve come to consider Thanksgiving staples–turkey, dressing, potatoes, gravy, my mom’s cranberry salad, fruit salad for Bob, Parker House rolls (that come out of the oven just as we sit down to eat), cranberry sauce, olives and pickles, carrots and green beans. This year the bird was huge–almost 25 pounds, but we like lots of left-overs. Of course we have to end with pie–two pumpkin and one apple. My Grandma Kennedy was famous for her pies. 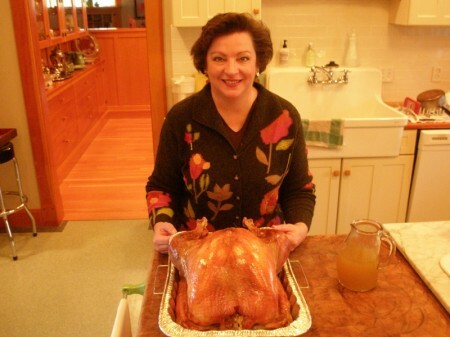 I remember once, years ago, when my brother brought his future bride home for Thanksgiving. Grandma had made the pies as usual, and Robin asked her if she had a recipe for her pie crust. Grandma calmly answered, “Yes. 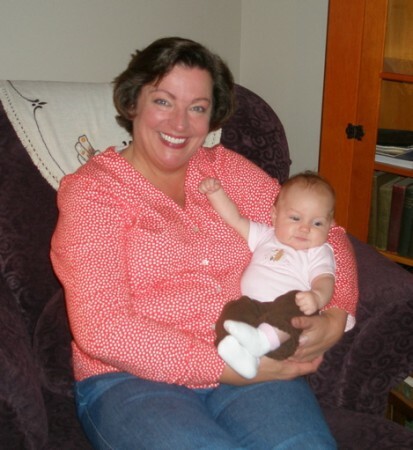 You take three pounds of Crisco, 16 cups of flour, a handful of salt and enough water.” That was enough pie crust for nine pies–but Grandma was used to baking a lot of pies at once! Oh, and I might add that the 16 cups of flour didn’t mean measuring cups. I remember Grandma just taking a tea cup out of the cupboard and dipping it in the flour bin 16 times. Now I’m in charge of pie crust. Thank goodness for the food processor and Martha Stewart for a more manageable recipe. 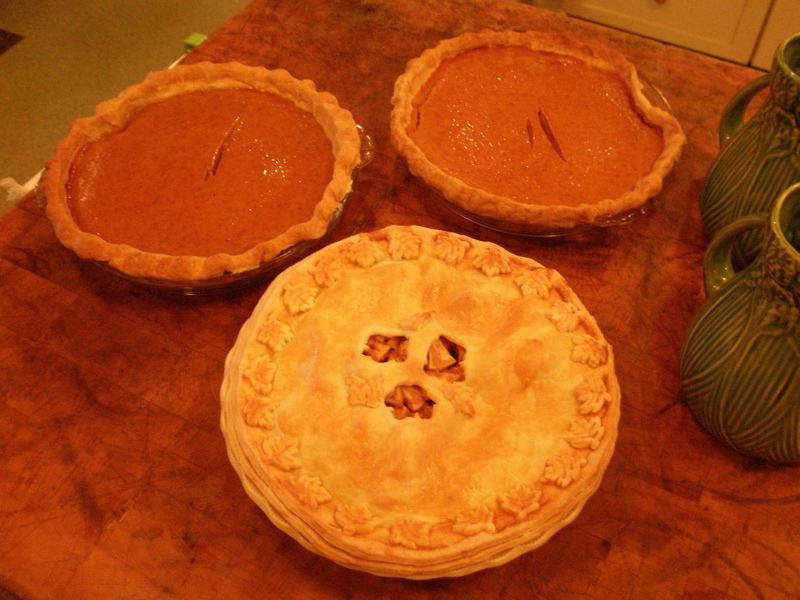 I made the apple and Mom, Sally and Cole made the two pumpkin pies. Here we all are, almost ready for the first bite! Today everyone came back for lunch and turkey sandwiches. 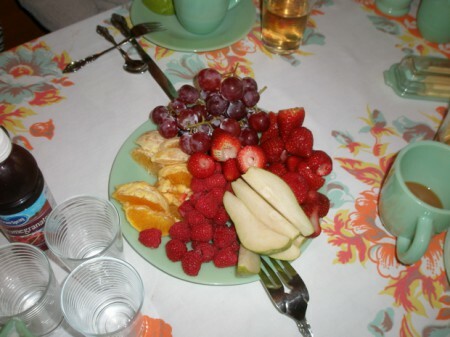 Oh, another chance to set the table and use different dishes! Actually, these are our everyday dishes, pretty jadeite. But I did get out my rainbow Bakelite flatware and the Scotty dog napkin rings. They have wheels. Wheels on napkin rings! What a swell invention. You can have napkin ring races at the table. I hope you enjoyed your holiday as much as I enjoyed mine. 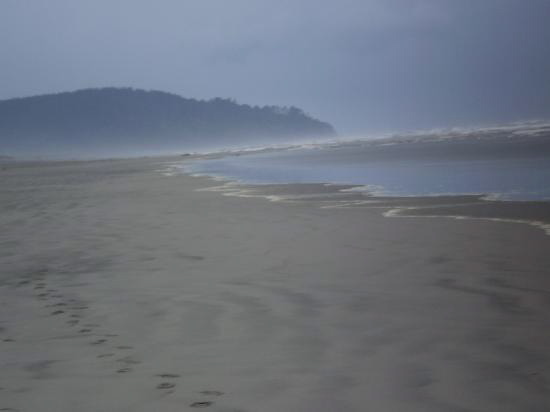 And I have to say that this whole blogging thing is totally cool–and not nearly as hard as I thought it would be. Monica, you were right! Again!